Yes, that's right...I eat eggplant basically every day during summer, and I have so many recipes (often I just make them up)!! I was craving for a pasta dish lately, so I made a cold capellini (angel hair pasta) with Japanese eggplant. Once the eggplants are grilled, I peeled the skin and cut most of them into small pieces. I also cut some of them into thin strips. So, I can enjoy the different textures in the dish. Small cut eggplants were pureed with roasted garlic, then mixed with a small amount of yuzu-kosho, chopped dill, lemon juice, yuzu juice, olive oil, grated Parmigiano Reggiano salt and pepper. Capellini pasta was boiled 1 minute longer than the package instructions. After drained and rinsed in cold water, the pasta was quickly chilled in ice water. Ice water tightens the texture of the pasta, so it's important to cook it longer. Otherwise, the pasta would become too firm. 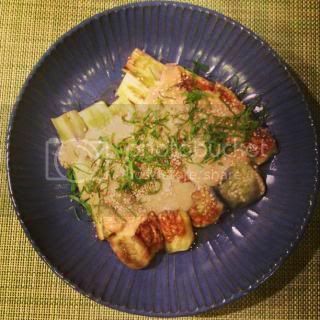 Pasta was quickly tossed in the sauce, divided into plates, and garnished with more Parmigiano Reggiano, diced tomato, shiso leaves, and more olive oil. The texture, flavor, and the temperature were all perfect! I loved the hint of yuzu-kosho flavor...it wasn't overpowering, but rather it gave a nice accent and aroma. I also liked that I used dill to mix with the pasta and used shiso for topping, it made the dish so refreshing and more complex. To prepare the tomatoes, blanch them 10 seconds in boiling water, shock in the ice water, and peel the skin. Cut into quarters and drain the juice and seeds. Cut into small cubes. In a small bowl, season the tomato with some salt, pepper, and olive oil. Chill in the refrigerator. Roast eggplant and garlic on a net over gas stove until the skin is charred and inside is soft. Peel the skin. Cut 3 egg plants into small pieces and put in a bowl. Cut the remaining 1 egg plant into strips. 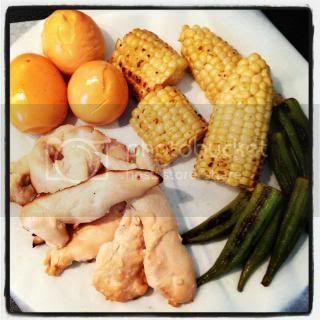 Set aside in a separate plate. 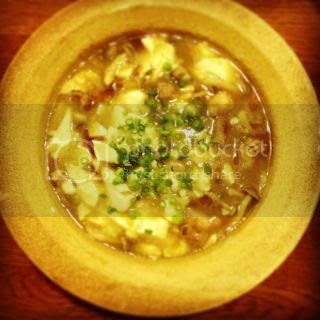 Puree the small cut eggplants with roasted and peeled garlic. Add the remaining ingredients for the sauce and mix well. Cover and chill in refrigerator. Meanwhile, cook the capellini 1 minute longer than the instructions in a package. Drain and rinse in cold water, then immediately transfer to an ice water. Let it chill for 30 seconds. Drain well. Add the cappellini and saved eggplant slices into the bowl with the pureed eggplant sauce. 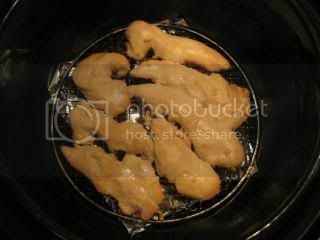 Toss by using tongs. Divide into 3 plates. Garnish with additional Parmigiano Reggiano, salt, pepper, tomatoes, and shiso leaves. Serve immediately. 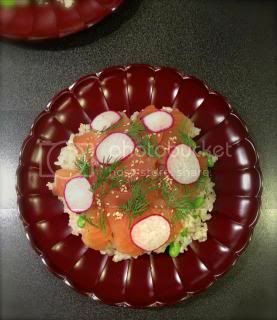 With my umami-rich gravlax, I also like to make simple Gravlax Chirashi Sushi! 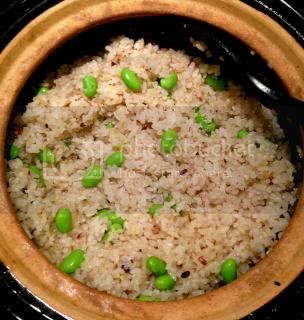 I make sushi rice with my double-lid donabe rice cooker, "Kamado-san", and season the rice with my Kyoto-style "Awase-zu". Rice was mixed with edamame and topped with a layer of sliced gravlax. Really delicious. 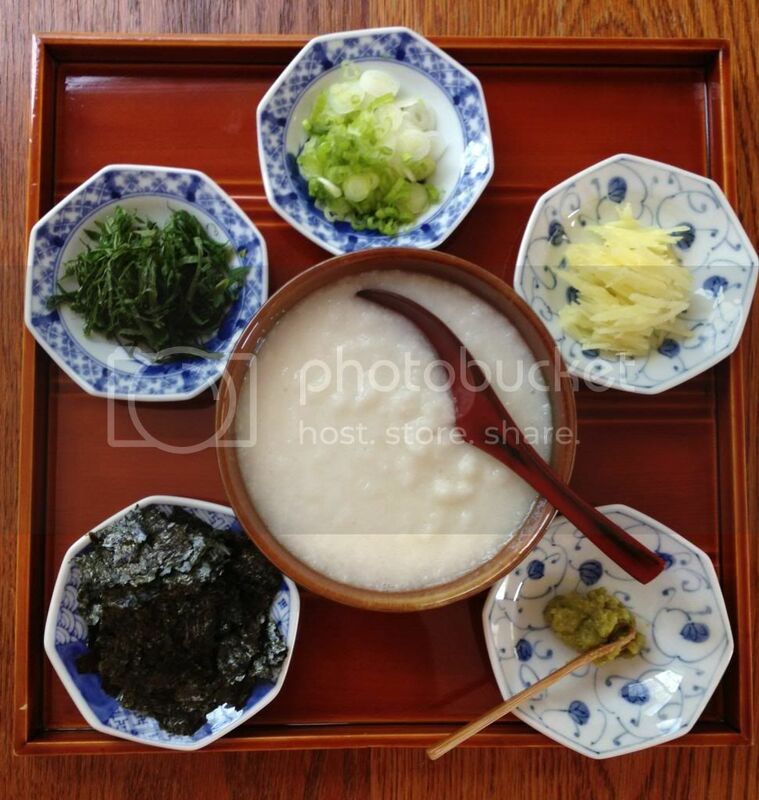 As soon as the rice finished resting and ready, pour in the "Awase-zu" and quickly and gently fluff the rice. Add the edamame and fluff again. 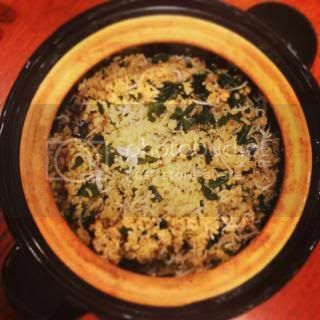 Cover with just a top lid and let the rice cool down to slightly warm temperature. Divide the rice into 5 plates. Cover the rice with the gravlax slices. Granish with sesame seeds, radish, and dill. Serve immediately. 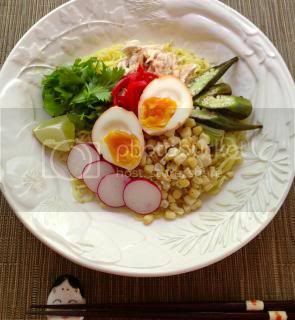 *In the picture, I cooked partially-polished brown rice with some addition of multi-grains. So good. Whenever I get a whole half filet of fresh quality salmon, I save a good piece and make a gravlax with it. 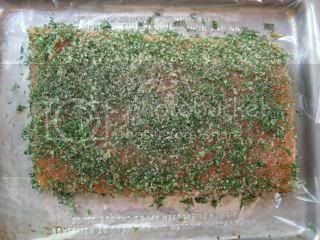 My gravlax is very simple, and it has a hint of good Japanese nuance, because I use some shiso leaves and also "Moshio" sea salt. 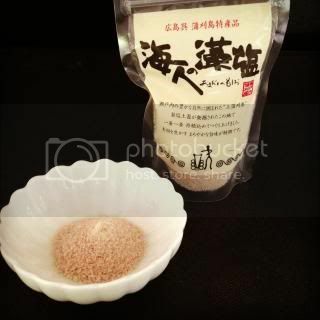 This is "Moshio" sea salt, from a small island off Hiroshima in Japan. 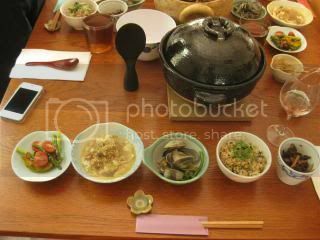 In the process of the salt's making, "hondawara" seaweed was cooked in sea water and roasted with the salt until it becomes like ashes. 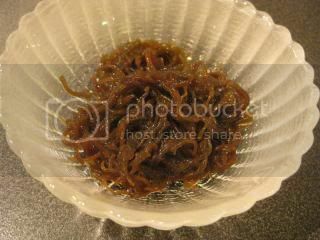 This is the most ancient style of seaweed. 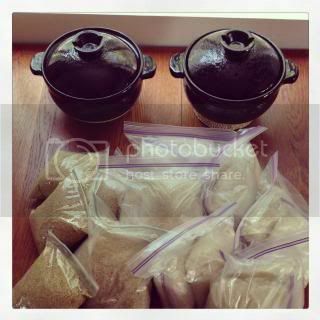 In the island, they recovered ancient clay pots (yes, donabe!) 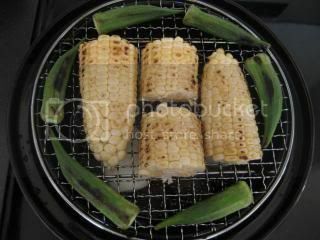 which were used for making "Moshio" over 1,000 years ago from the ruins! 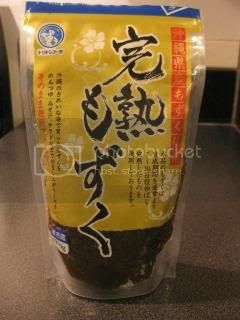 "Hondawara" seaweed is very rich in umami flavor, so this ancient style sea salt is naturally rich in umami flavor and also very mild. 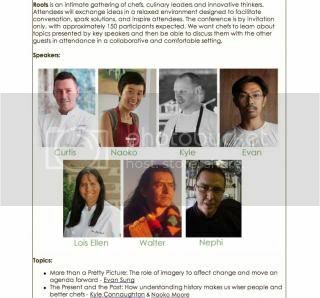 "Moshio" has been a staple ingredient in my kitchen. It's even great for a simple onigiri (rice ball) with no other ingredients. The good news..."Moshio" sea salt is distributed in the US, so US people can order online easily. So, I make the seasoning for curing salmon by using "Moshio" sea salt. Here's my gravlax recipe. Mix together the ingredients for the seasoning mix. 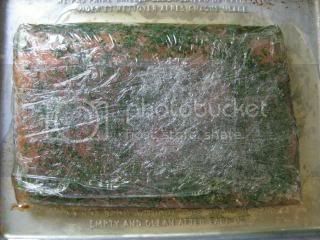 Line a tray with a piece of plastic wrap and spread half amount of the seasoning mix. Place the salmon over the seasoning mix and cover the top surface with the remaining seasoning mix. Spread evenly to cover all sides of the salmon. 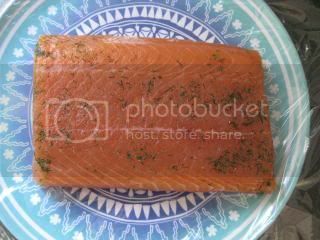 Let the salmon cure in refrigerator for 24 hours. Unwrap and gently rise off the seasoning from the salmon and pat dry. After 24 hours, the salmon will release some juice. It's gently rinsed and patted dry, then the gravlax is ready. 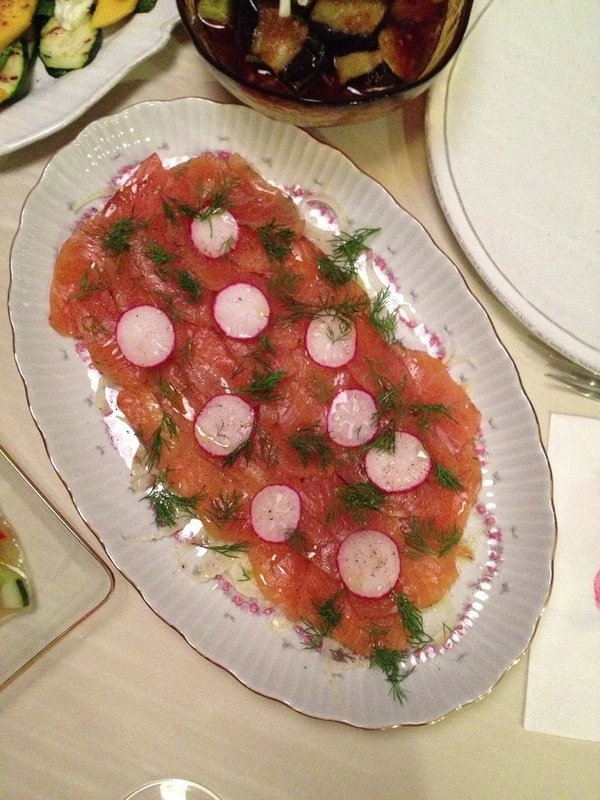 Here's a simple gravlax salad. 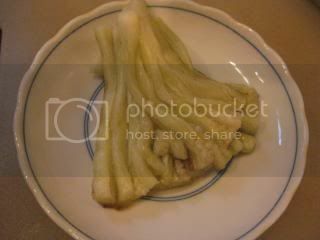 I spread shavedfennel bulb in the bottom, sprinkle some salt, pepper, lemon juice, and olive oil. 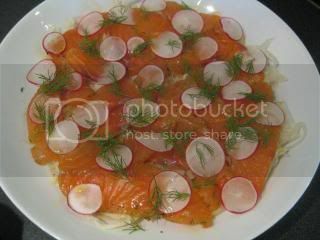 Then I make a layer of sliced gravlax, garnish with fennel and sliced radish, and drizzle a little more lemon juice and olive oil. That's it. 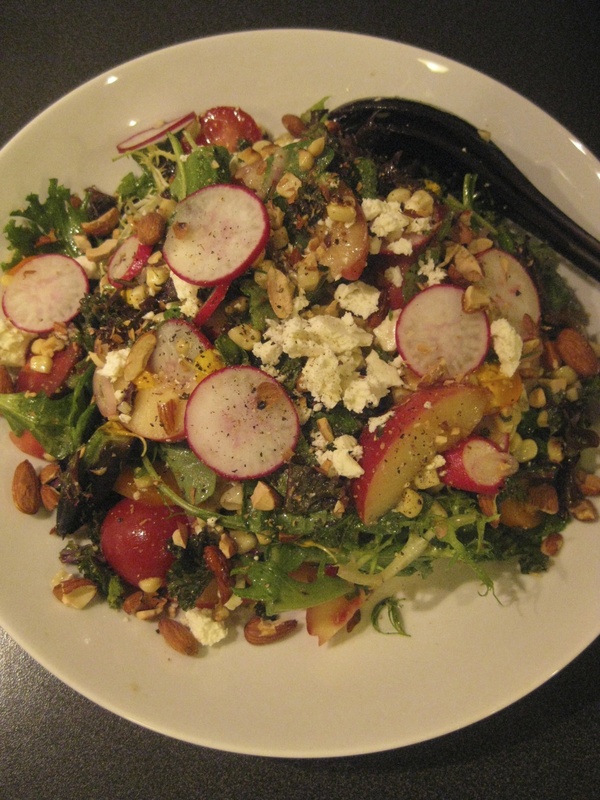 This salad is so simple and so tasty. 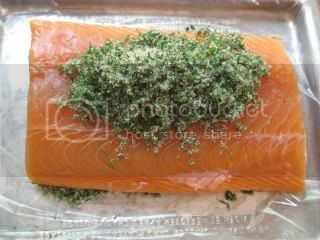 My salmon gravlax is umami rich with "Moshio" seaweed with a hint of shiso. So wonderful! 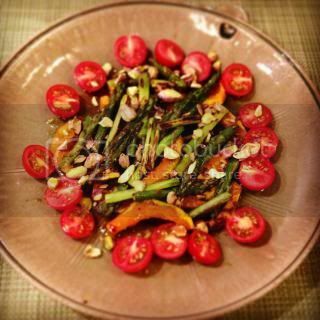 "Awase-zu" marinated peach with summer vegetables...power salad! This salad has become a big hit at home and among home guests this summer. After marinating (quick-pickling) peach and shallot in my Kyoto-style "Awase-zu", I make vinaigrette with it and olive oil. It's so delightful! 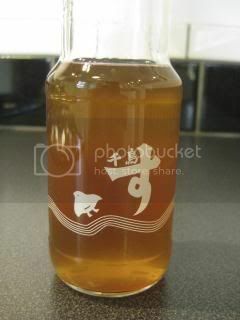 Also, because "Awase-zu" is very mild in acidity, you need much less oil to mix with it to make a vinaigrette. So, the salad is filling yet really light. 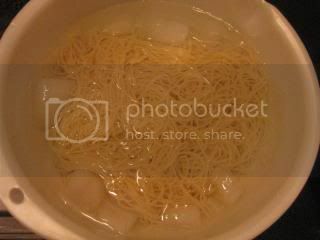 In a bowl, combine the "Awase-zu" and lemon juice with a pinch of salt. Add the peach and shallot. Cover and let them marinade for 15-30 minutes. 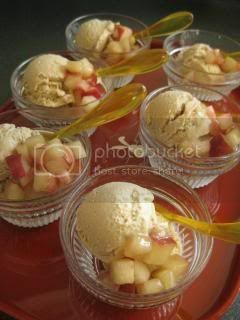 Remove the peach and set aside. 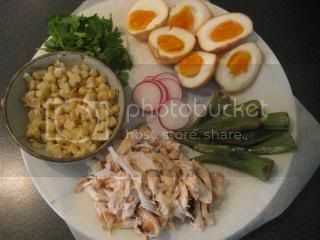 In a large bowl, combine the rest of the ingredients and add the "Awase-zu" vinaigrette. Toss and transfer to a serving plate. Back in my last trip to Kyoto, I visited Murayama Zosu, who makes famous "Chidori-su" brand vinegar and is one of the oldest and most traditional rice vinegar makers in Japan. During the visit, Murayama-san, the owner of the company kindly gave gifts of their products to my friend and I. One of them was Chidori-su brand's "Awase-zu", which is their rice vinegar, seasoned with mirin, sugar, salt, soy sauce, and yuzu juice. Their "Awase-zu" was so round, delicate, and tasty. I used it for so many different dishes and used up so quickly. I really wanted to make a similar "Awase-zu" myself, but the only clues were the ingredients list in the back label of the bottle and my memory of the aroma. After a few test kitchen experiments, I could make my version of "Awase-zu", which has the closest aroma and flavor to their "Awase-zu"! I was so happy. So, I put mine in the original Chidori-su's "Awase-zu" bottle. For the best result, I highly recommend you find premium Kyoto brand vinegar, which is brewed to best result with very natural and mild flavors. But, I know it's not easy to find such vinegars in the US, so you could also make it with other Japanese brands' rice vinegar with milder acidity level (about 4.2%). 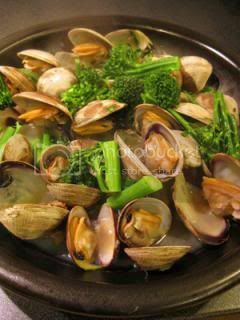 In a sauce pan, combine all the ingredients except for the yuzu juice. Set over medium heat. Stir to dissolve the sugar and salt. As soon as it starts boiling, turn off the heat. Add the yuzu juice and let it cool it down. 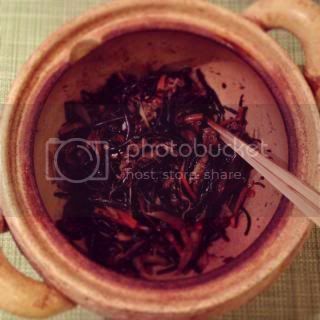 You can simply drizzle this "Awase-zu" over grilled fish, seaweed salad, etc. 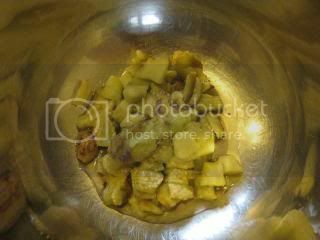 Or, mix with olive oil with some salt and pepper and make Japanese-style vinaigrette. 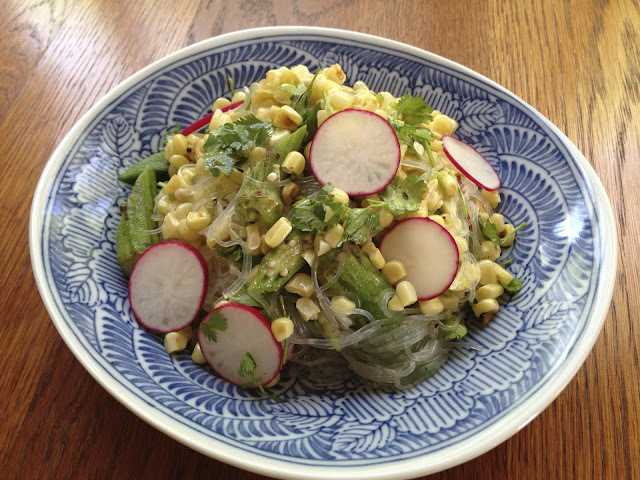 Here's one of my regular dishes made with "Awase-zu" this summer. 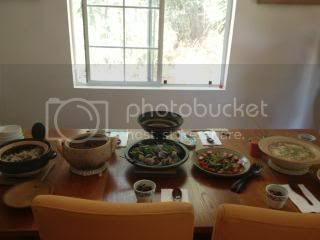 I got an inspiration to make this when I visited accessory designer, Chan Luu's beautiful home for breakfast. 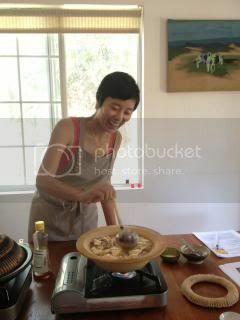 Chan is a wonderful cook and she made marinated heirloom tomatoes with white balsamic vinegar and olive oil. Blanch the tomatoes in simmering water for 10 seconds. Shock them in ice water and peel the skin. Cut the tomatoes into wedges. 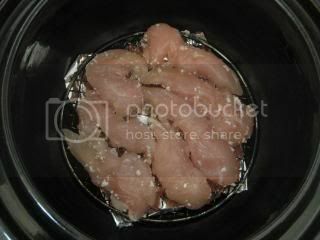 Put them in a strainer and let them drain excess liquid for 15-30 minutes. Meanwhile, whisk together the ingredients for the marinade. Set aside. 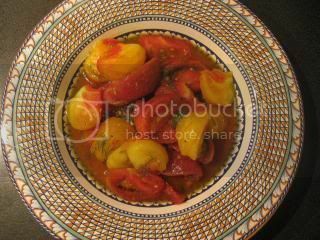 In a bowl, combine the tomato wedges and the marinade. 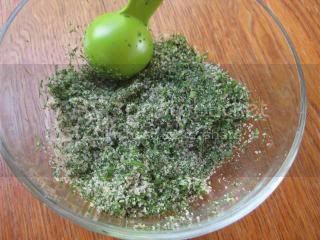 Add some dill leaves and gently mix them together with a large spoon. Cover and refrigerate for a couple of hours. Meanwhile, stir a couple of times for even marinade. This dish is like a eating gazpacho. It's so tasty and you want to drink up all the juice to finish the dish. Just like every summer, I've been eating a lot of cold noodles for lunch this summer. 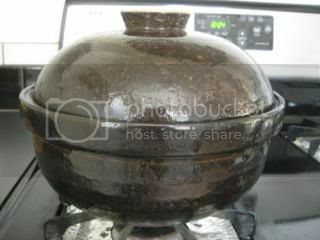 Whether it's somen, udon, or hiyamugi noodles, I always use donabe as a serving vessel for the cold noodles. The fun part about getting ready the cold noodle dish is to prepare the condiments. 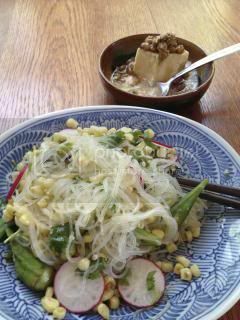 The favorite of this summer is using tons of grated mountain yam ("yama-imo") and yuzu-kosho and mix them lightly after topping them on the noodles in a dipping sauce. 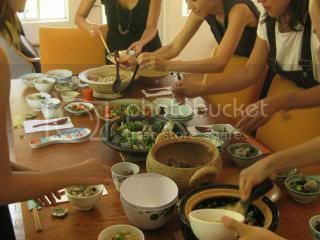 Other regular condiemts are, shredded ginger, sliced scallion, sliced shiso, torn nori seaweed, and roasted sesame seeds. Fantastic. 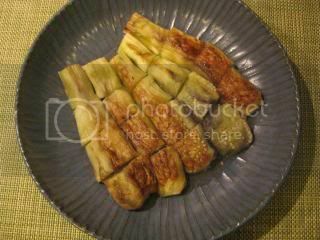 As a side dish, I grilled some Japanese eggplants. 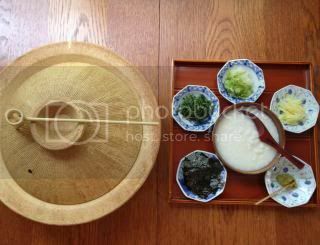 And, served with simple sesame sauce, garnished with ground sesame seeds and shiso leaves. Here's my quick sesame sauce recipe. 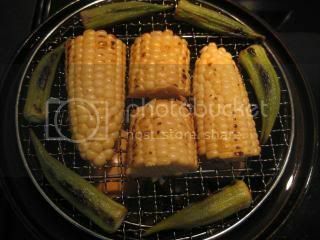 Roast 2 tablespoons white sesame seeds until aromatic. 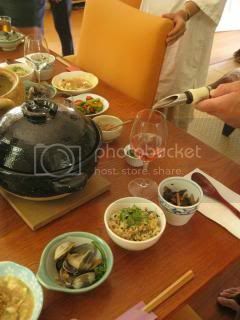 In Japanese mortar and pestle ("suribachi and surikogi"), ground the sesame seeds until very fine. 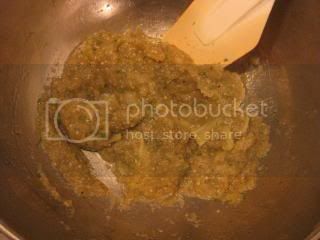 Add 2 teaspoons raw brown sugar, 1/2 tablespoons shio-koji (or 1/3 teaspoons sea salt), 2 tablespoons tahini paste, 1 1/2 tablespoons light color soy sauce ("usukuchi shoyu"), and 1 1/2 tablespoons rice vinegar. Whisk together until smooth. 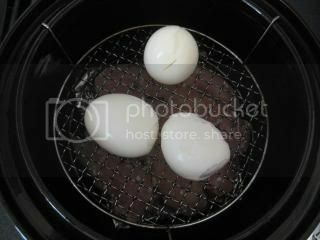 Pour over grilled eggplants (peeled and cut). Garnish with some ground sesame seeds and shiso leaves.